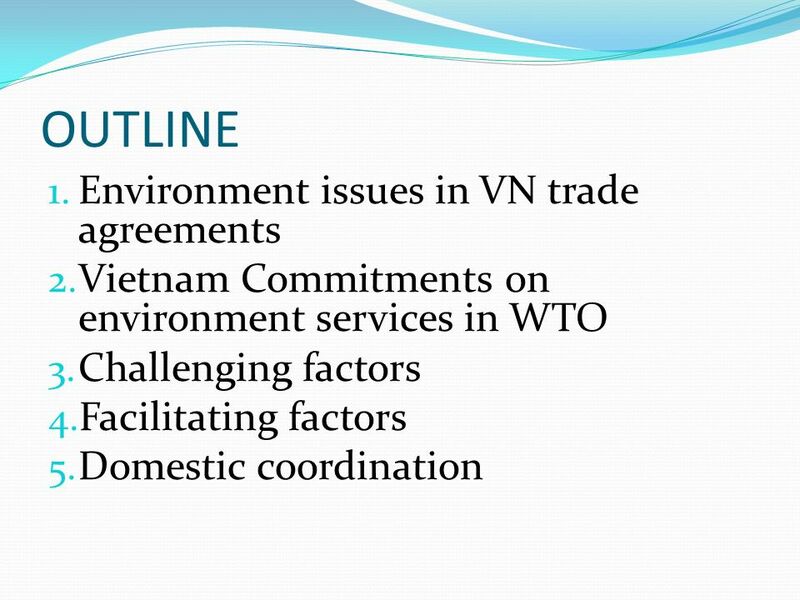 Tran Thi Thu Hang Deputy Director General Ministry of Trade, Vietnam FACTORS FACILITATING AND CHALLENGING NEGOTIATION OF ENVIROMENT ISSUES IN RTA/FTA/WTO. 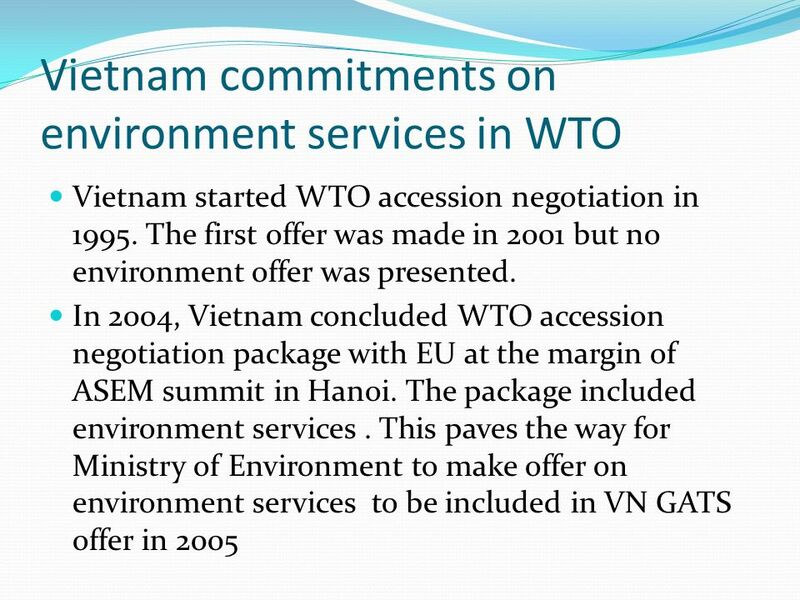 4 Environment issues in VN Trade agreements (contd) Vietnam engaged in more than 70 bilateral trade agreements with its trading partners. 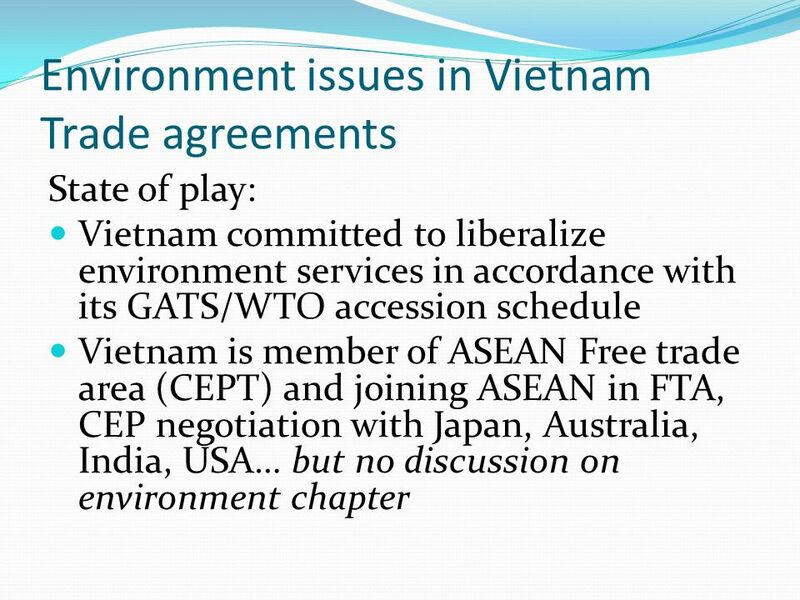 But no provision on environment protection or cooperation, except the Bilateral Trade Agreement with the USA (BTA) referring to Article 20 of GATT. 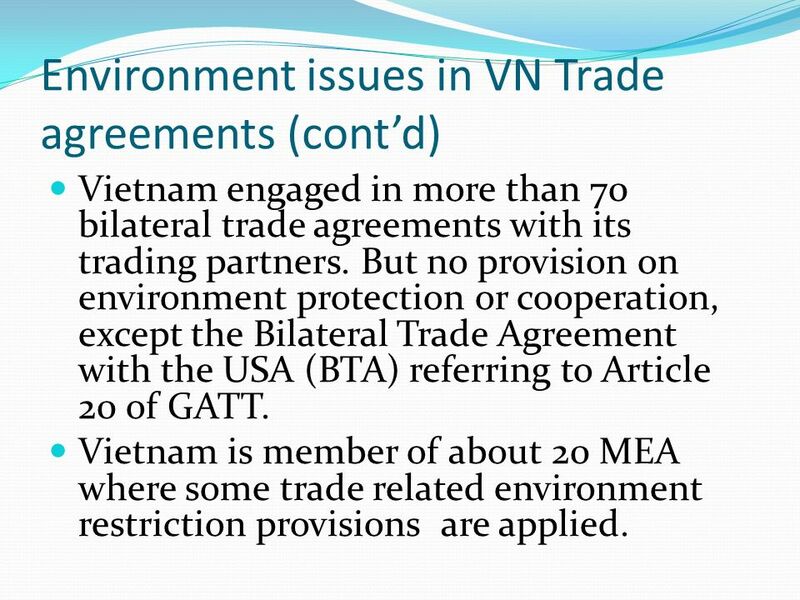 Vietnam is member of about 20 MEA where some trade related environment restriction provisions are applied. 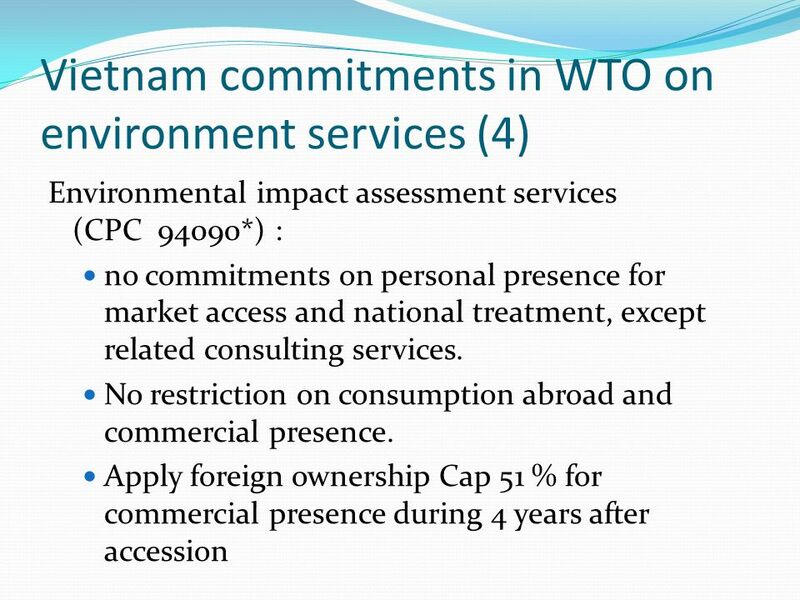 6 Vietnam commitments in WTO on environment services (1) Sewage Services(CPC 9401) : no commitments made on cross border supply mode for market access and national treatment, except related consulting services. No restriction on consumption abroad and commercial presence. Apply 51 % cap on foreign ownership during 4 years after accession. 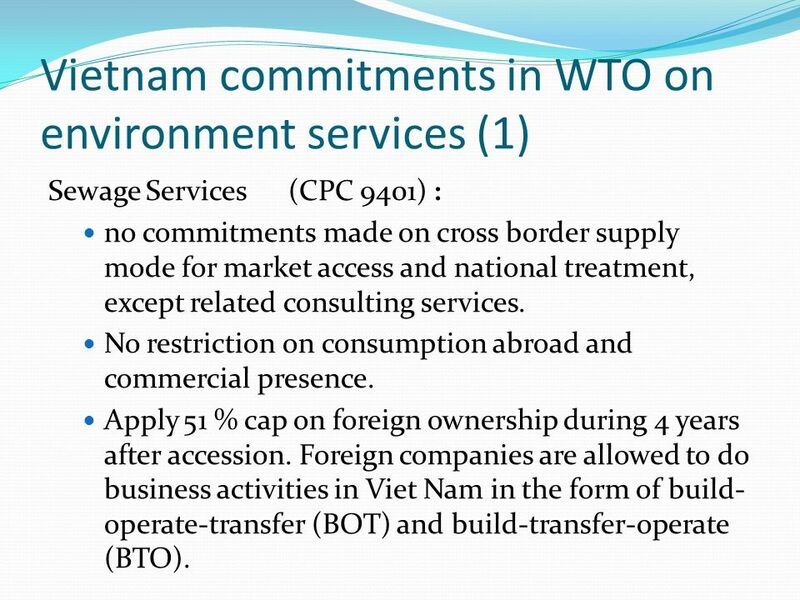 Foreign companies are allowed to do business activities in Viet Nam in the form of build- operate-transfer (BOT) and build-transfer-operate (BTO). 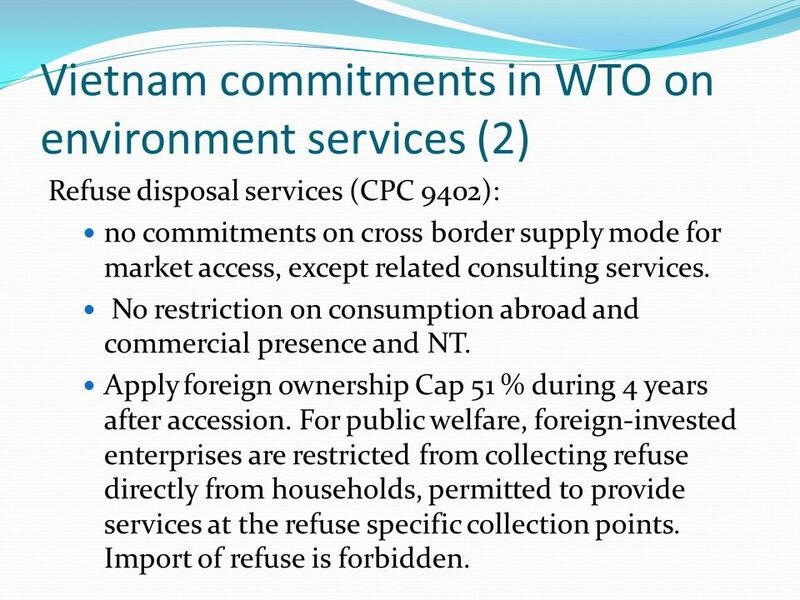 7 Vietnam commitments in WTO on environment services (2) Refuse disposal services (CPC 9402): no commitments on cross border supply mode for market access, except related consulting services. 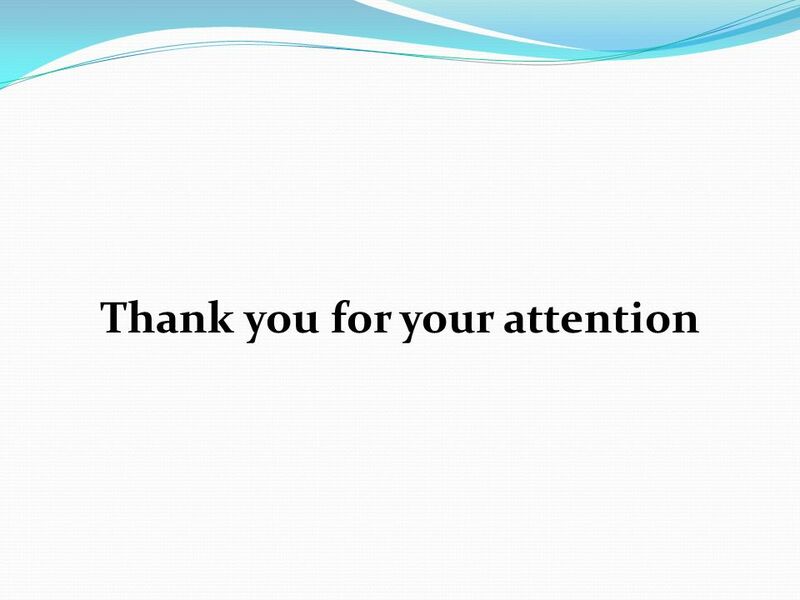 No restriction on consumption abroad and commercial presence and NT. Apply foreign ownership Cap 51 % during 4 years after accession. For public welfare, foreign-invested enterprises are restricted from collecting refuse directly from households, permitted to provide services at the refuse specific collection points. Import of refuse is forbidden. 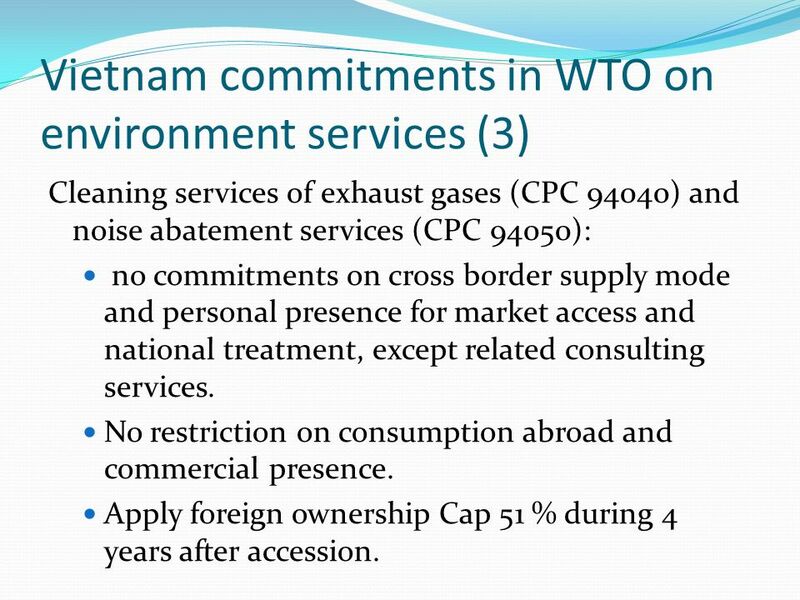 8 Vietnam commitments in WTO on environment services (3) Cleaning services of exhaust gases (CPC 94040) and noise abatement services (CPC 94050): no commitments on cross border supply mode and personal presence for market access and national treatment, except related consulting services. No restriction on consumption abroad and commercial presence. Apply foreign ownership Cap 51 % during 4 years after accession. 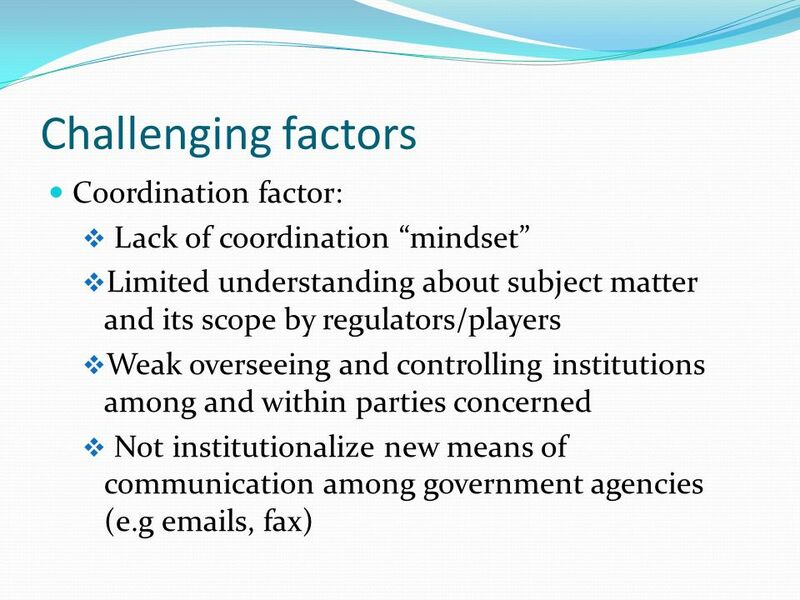 10 Challenging Factors Mandate is not clearly defined Competence factor: Regulatory competence is not clearly allocated and dispatched among government agencies, especially environmental services regulations. 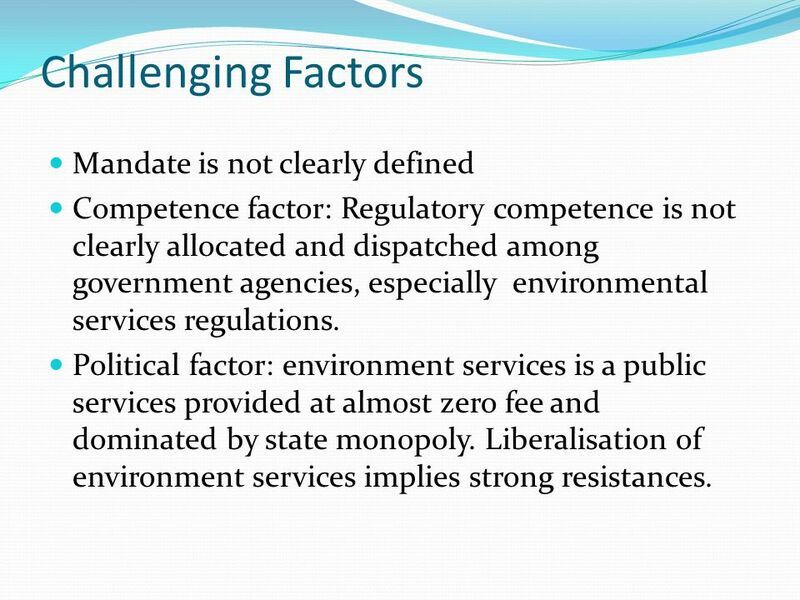 Political factor: environment services is a public services provided at almost zero fee and dominated by state monopoly. 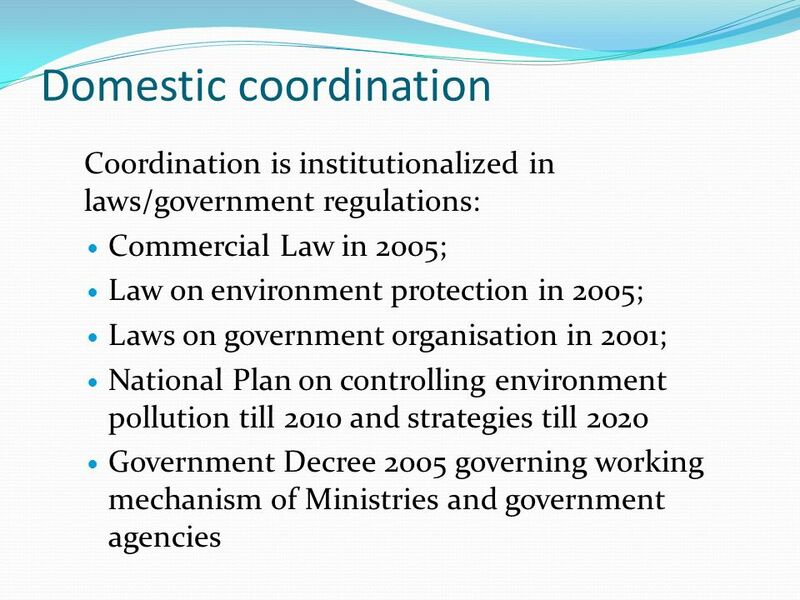 Liberalisation of environment services implies strong resistances. 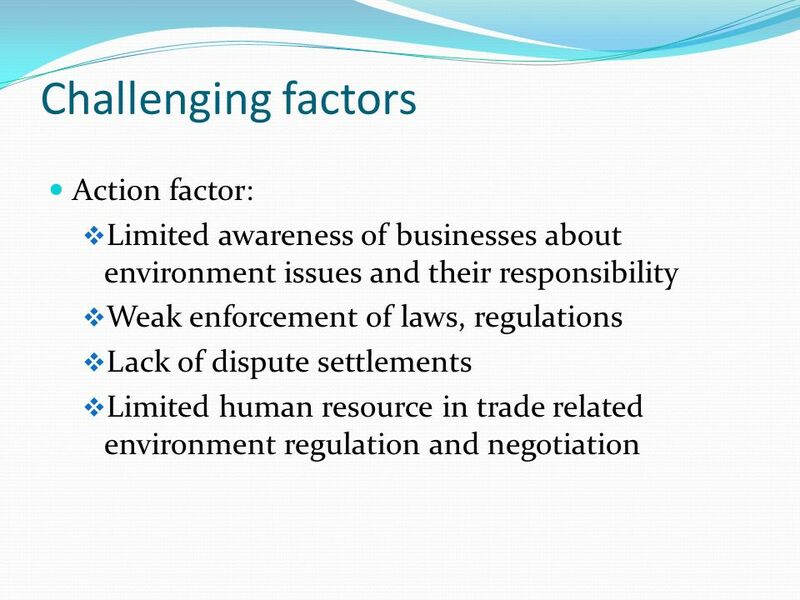 11 Challenging Factors Legislative factor: environmental and trade related legislation is not completed and advanced. 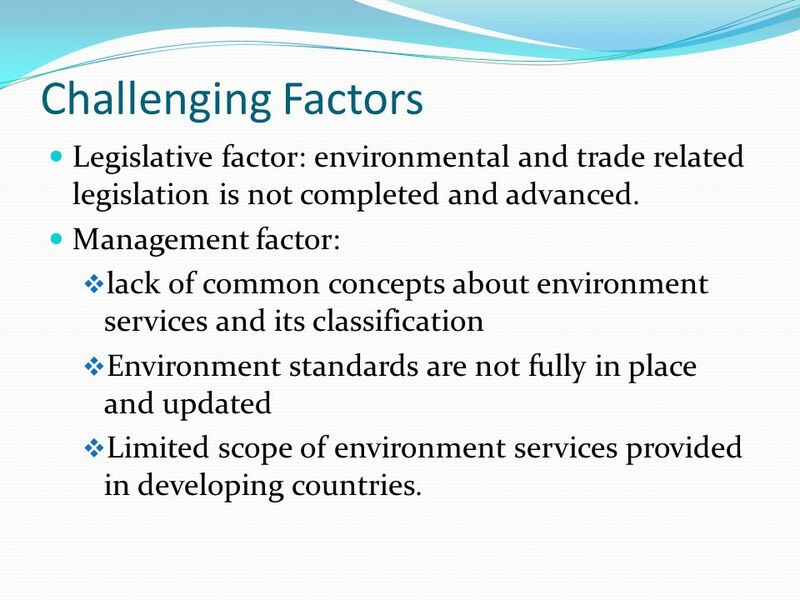 Management factor: lack of common concepts about environment services and its classification Environment standards are not fully in place and updated Limited scope of environment services provided in developing countries. 16 Facilitating factors Leading role of success business in applying ISO 14000 and creating environment friendly business Liberalize environment service ensures access to better and more affordable technologies for environment protection Environment friendly products = ease of exports Confidence building process through technical assistance from donors to provide arguments on the issues. 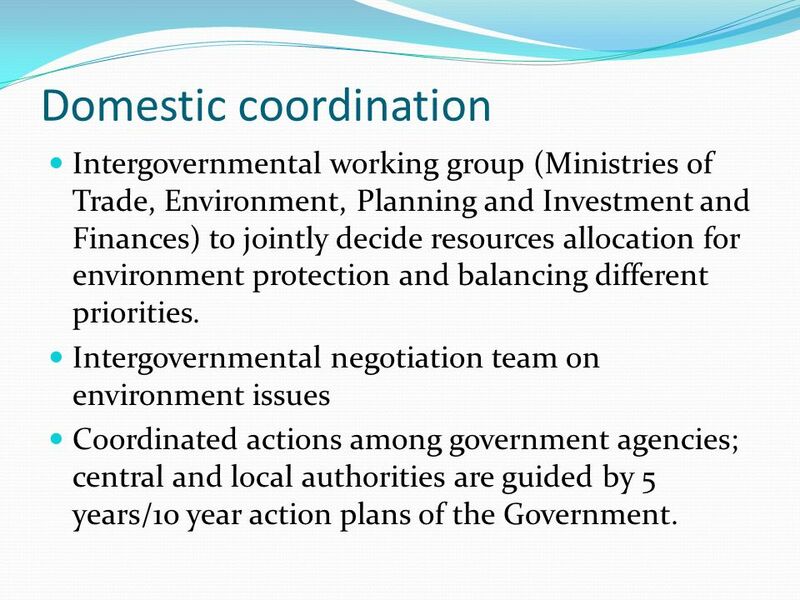 18 Domestic coordination Intergovernmental working group (Ministries of Trade, Environment, Planning and Investment and Finances) to jointly decide resources allocation for environment protection and balancing different priorities. 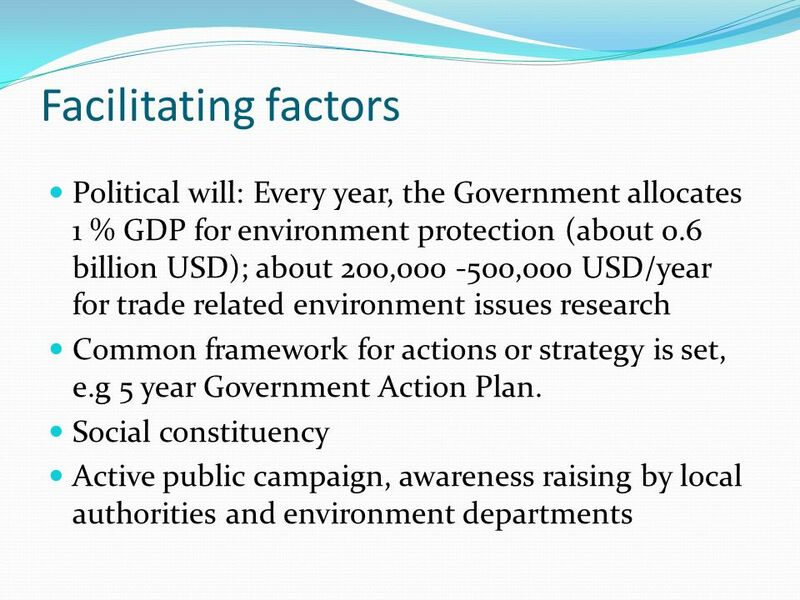 Intergovernmental negotiation team on environment issues Coordinated actions among government agencies; central and local authorities are guided by 5 years/10 year action plans of the Government. 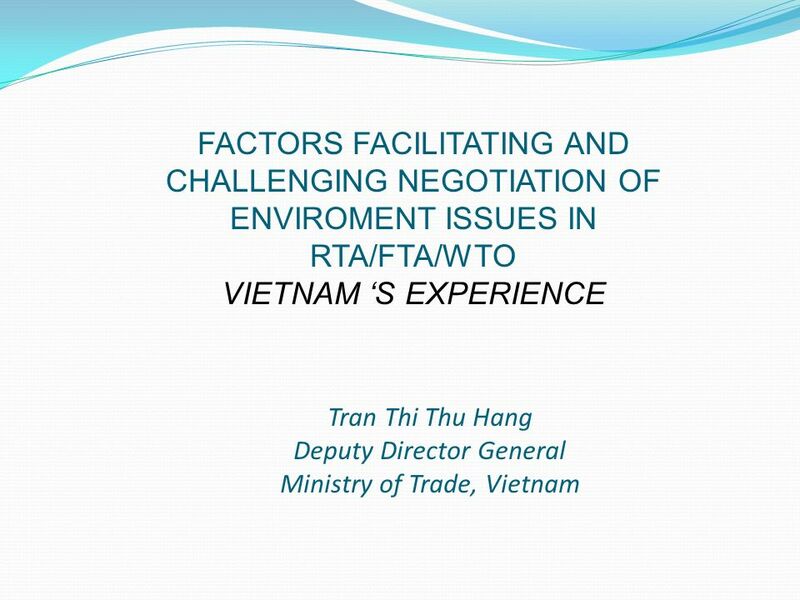 Download ppt "Tran Thi Thu Hang Deputy Director General Ministry of Trade, Vietnam FACTORS FACILITATING AND CHALLENGING NEGOTIATION OF ENVIROMENT ISSUES IN RTA/FTA/WTO." 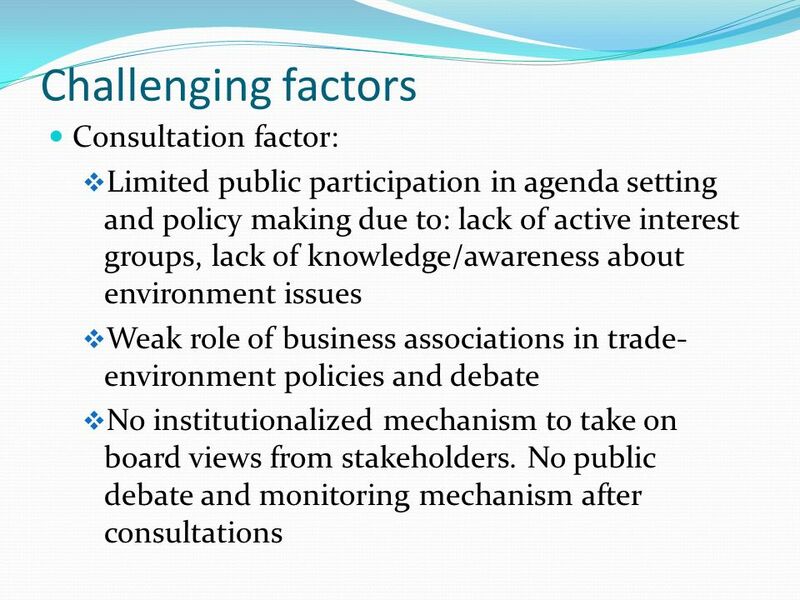 Free Trade Agreements: Trade and environment related capacity building Nina C. Rør, Deputy Director General. September 2012 Da-un, Jeong Deputy director, Public Contract and Procurement Policy Division Ministry of Strategy and Finance, the Republic of Korea. One law firm around the world One law firm around the world Introduction to the General Agreement on Trade in Services David Hartridge Hanoi, Vietnam August. World Trade Organization Impacts on China and Hong Kong. Distribution Services: Vietnam Case Dang Nhu Van Hanoi May 2005. C OMPETITION POLICY CHAPTER IN THE T RANS -P ACIFIC P ARTNERSHIP (TPP) A GREEMENT Alice Pham CUTS International Hanoi Resource Centre. One law firm around the world One law firm around the world Scheduling GATS Commitments & Sectors of Interest to Vietnam David Hartridge Hanoi, Vietnam. HOW GHANA HAS IMPROVED ITS EASE OF DOING BUSINESS INDICATORS Mawuena Trebarh (Mrs.) – Chief Executive Officer Ghana Investment Promotion Centre, gipcghana.com.